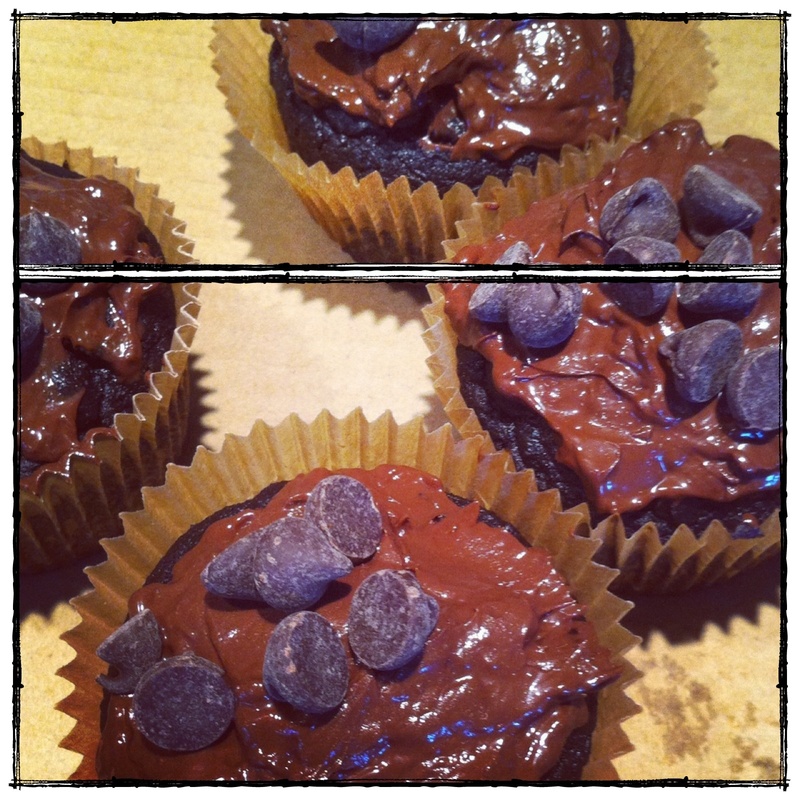 Chocolate cupcakes, with chocolate frosting, with chocolate chips. Chocolate x3. You can thank me later for sharing this recipe with you. Once again, it is brought to you by the lovely Juli over at PaleOMG… This lady knows how to cook. I didn’t change a thing – and I’ve made these 5+ times now, and they are soooooo tasty. They are grain-free and dairy-free… and now that I think about it, sugar-free (they are sweetened with dates)… technically Paleo cupcakes. Even if you aren’t a Paleo enthusiast, try these! The texture is that of a “real cupcake” and the taste is incredible. We brought these to some friend’s house for dessert the other night, and saw on Instagram the next morning that they ate them again for breakfast – just sayin. Alright, with no further ado…. you have some chocolate to consume. 1. Preheat oven to 350, and line muffin pan with silicone liners or paper liners. 2. Add dates to food processor, and process until no longer chunky. It will be a sticky mess, but what is baking without a bit of a mess? 3. Add other wet ingredients (coconut oil, coconut milk,vanilla, eggs, egg whites) to the dates, and process until smooth. 4. Mix dry ingredients (flour, cinnamon, baking soda, salt, cocoa) together in a bowl; add wet to dry and mix until fully incorporated. 5. Scoop into muffin pan. Mine usually yields about 9 cupcakes. 6. Bake for 22-25 minutes, or until toothpick comes out clean. 7. While cupcakes are baking, make frosting by melting coconut oil and chocolate chips on the stove over low heat, until fully combined. Stir in a pinch of salt. Until cooled, this mixture will be VERY runny. It helps to put it in the refrigerator for a few minutes until it has thickened up a bit and is spreadable. 8. Allow cupcakes to cool completely before frosting. 9. Frost, top with chocolate chips, and eat em all up. Or share with your friends. That would be better. This entry was posted in Gluten Free, Paleo, Sweets + Treats, Vegetarian and tagged chocolate, coconut flour, coconut milk, coconut oil, erin by Flax + Honey. Bookmark the permalink. Omg, these are amazing! You are right, the texture is like a “real cupcake,”they are so moist! This is my new favorite dessert!